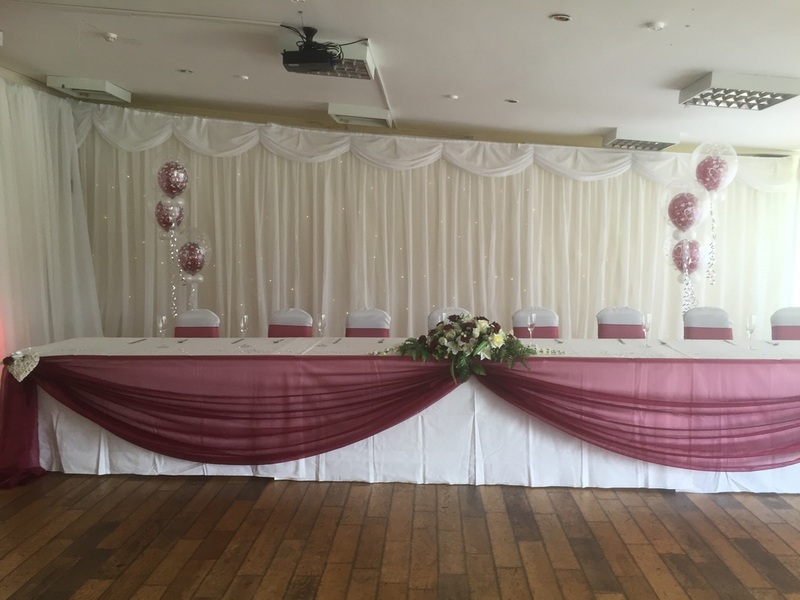 Why not transform your venue by draping the walls or a feature wall. We can drape walls in white drapes and swags, which give the walls a marquee look. This is perfect for walls you want to hide and can also be used to disguise bars, pictures or to lighten a room, which may have dark décor. This is a freestanding system so it can be placed in any room. ​As a result of this there is a lot of equipment needed and so this often works out more costly than people think. We need the dimensions of your room in order to work out a price for you. With regards to drape ceilings we would need to view the venue first to see if it is possible to do as some venues this is impossible to do this without damaging the fabric of the building. Here at the Hilton we draped the whole room and some of the sections of the room we added fairy lights in the drapes. We then also draped the ceiling. We got to drape the Avon Gorge Hotel Restaurants windows for a new year Wedding. The Brides colour theme was black and white. Enchanted Weddings and Events Bristol - We specialise in transforming all events into something spectacular including weddings, civil partnerships, birthdays, anniversaries.